"Matranga family" and "Matranga crime family" redirect here. For the gang in Los Angeles, see Los Angeles crime family. The New Orleans crime family is an Italian-American Mafia Crime family based in the city of New Orleans. The Crime Family has a history of criminal activity dating back to the late nineteenth century. The family reached its height of influence under Carlos Marcello, one of the world's richest and most powerful crime bosses during the mid-twentieth century, and at its height had over 300 made members and around 3,000 criminal associates. However, a series of setbacks during the 1980s reduced its clout, and law enforcement dismantled most of what remained shortly after Marcello's death in 1993. In spite of this, it is believed that some elements of the organization remain active in the Big Easy today. The Matranga crime family, established by Charles (1857 - October 28, 1943) and Antonio (Tony) Matranga (d. 1890 ? ), was one of the earliest recorded American Mafia crime families, operating in New Orleans during the late 19th century until the beginning of Prohibition in 1920. Born in Sicily, Carlo and Antonio Matranga settled in New Orleans during the 1870s where they eventually opened a saloon and brothel. Using their business as a base of operations, the Matranga brothers began establishing lucrative organized criminal activities including extortion and labor racketeering. Receiving tribute payments from Italian laborers and dockworkers, as well as from the rival Provenzano crime family (who held a near monopoly of commercial shipping from South American fruit shipments), they eventually began moving in on Provenzano fruit loading operations intimidating the Provenzanos with threats of violence. Although the Provenzanos withdrew in favor of giving the Matrangas a cut of waterfront racketeering, by the late 1880s, the two families eventually went to war over the grocery and produce businesses held by the Provenzanos. As both sides began employing a large number of Sicilian mafiosi from their native Monreale, Sicily, the violent gang war began attracting police attention, particularly from New Orleans police chief David Hennessy who began investigating the warring organizations. Within months of his investigation, Hennessy was shot by several unidentified attackers while walking home on the night of October 15, 1890; he died of his wounds less than twelve hours later, having failed to identify his assailants beyond allegedly claiming "The Dagoes shot me". The shooter was never positively identified and the assassination remains unsolved. The murder of Hennessey created a huge backlash from the city and, although Charles and several members of the Matrangas were arrested, they were eventually tried and acquitted in February 1891 with Charles Matranga and a 14-year-old member acquitted midway through the trial as well as four more who were eventually acquitted and three others released in hung juries. The decision caused strong protests from residents, angered by the controversy surrounding the case (particularly in the face of incriminating evidence and jury tampering), and the following month a lynch mob stormed the jail killing 11 of the 19 defendants—five of whom had not been tried—on March 14, 1891. Matranga was able to escape from the vigilante lynchings and, upon returning to New Orleans, resumed his position as head of the New Orleans crime family eventually forcing the declining Provenzanos out of New Orleans by the end of the decade. Matranga would rule over the New Orleans underworld until shortly after Prohibition when he turned over leadership over to Sylvestro "Sam" Carollo in the early 1920s. Slot machines were installed in towns throughout Louisiana, generating a dependable stream of revenue for the "family". "Silver Dollar Sam" Carolla led the New Orleans crime family transforming predecessor Charles Matranga's Black Hand gang into a modern organized crime group. Born in Sicily, Carolla immigrated to the United States with his parents in 1904. By 1918, Carolla had become a high-ranking member of Matranga's organization, eventually succeeding him following Matranga's retirement in 1922. Assuming control of Matranga's minor bootlegging operations, Carolla waged war against rival bootlegging gangs, gaining full control following the murder of William Bailey in December 1930. Gaining considerable political influence within New Orleans, Carolla is said to have used his connections when, in 1929, Al Capone supposedly traveled to the city demanding Carolla supply the Chicago Outfit (rather than Chicago's Sicilian Mafia boss Joe Aiello) with imported alcohol. Meeting Capone as he arrived at a New Orleans train station, Carolla, accompanied by several police officers, reportedly disarmed Capone's bodyguards and broke their fingers, forcing Capone to return to Chicago. In 1930, Carolla was arrested for the shooting of federal narcotics agent Cecil Moore, which took place during an undercover drug buy. Despite support by several New Orleans police officers who testified Carolla was in New York at the time of the murder, he was sentenced to two years. Released in 1934, Carolla negotiated a deal with New York mobsters Frank Costello and Phillip "Dandy Phil" Kastel, as well as Louisiana Senator Huey Long, to bring slot machines into Louisiana, following New York Mayor Fiorello LaGuardia's attacks on organized crime. Carolla, with lieutenant Carlos Marcello, would run illegal gambling operations undisturbed for several years. Carolla's legal problems continued as he was scheduled to be deported in 1940, after serving two years in Atlanta Federal Penitentiary, following his arrest on a narcotics charge in 1938. His deportation was delayed following the U.S. entry into World War II, and Carolla would continue to control the New Orleans crime family for several years before a campaign, begun by reporter Drew Pearson, exposed an attempt by Congressman Jimmy Morrison to pass a bill awarding Carolla with American citizenship (thereby making deportation illegal). Carolla would be deported in April 1947. Soon after returning to Sicily, Carolla organized a partnership with fellow exile Charles Luciano, establishing criminal enterprises in Mexico. Briefly returning to the United States in 1949, he was deported the following year as control of the New Orleans crime family reverted to Carlos Marcello. Living in Palermo, Sicily until 1970, Carolla once again returned to the US. According to Life Magazine, he was asked to return by Marcello, who needed him to mediate disputes within the New Orleans Mafia. After a subsequent attempt to deport him failed, he died a free man in 1972. Born to Sicilian parents in French Tunisia, Carlos Marcello came to the United States as an infant in 1911. His family settled in a decaying plantation house near Metairie, Louisiana. Marcello later turned to petty crime in the French Quarter, which was then New Orleans' Little Italy. He was imprisoned for leading a crew of teenage gangsters who carried out armed robberies in the small towns near New Orleans. These charges were later dropped, but the following year[clarification needed] he was convicted of assault and robbery, and was sentenced to the State penitentiary for nine years, eventually serving five. In 1938, Marcello was arrested and charged with the sale of 23 pounds (slightly more than 10 kilograms) of marijuana. Despite receiving another lengthy prison sentence and a $76,830 fine, Marcello served less than 10 months in prison. On his release from prison, Marcello became associated with Frank Costello, the leader of the Genovese crime family in New York. By the end of 1947, Marcello had taken control of Louisiana's gambling network. He had also joined forces with Meyer Lansky in order to take over and split the profits from some of the most important gambling casinos in the New Orleans area. According to former members of the Chicago Outfit, Marcello was also assigned a cut of the money skimmed from Las Vegas casinos in exchange for providing muscle in Florida real estate deals. By this time Marcello had been crowned as the Godfather of the Mafia in New Orleans by the family's capos and the Commission. He was to hold this position for the next 30 years. On March 24, 1959, Marcello appeared before the Senate Committee investigating organized crime. Serving as chief counsel to the committee was Robert F. Kennedy; his brother, Senator John F. Kennedy, was a member of the committee. In response to committee questioning, Marcello again invoked the Fifth Amendment by refusing to answer any questions relating to his background, activities, and associates. After becoming president, John F. Kennedy appointed his brother, Robert Kennedy, as U.S. Attorney General. The two men worked closely together on a wide variety of issues including the attempt to tackle organized crime. In March 1961, the Attorney General took steps to have Marcello deported to Guatemala (the country Marcello had falsely listed as his birthplace). On 4 April, Marcello was arrested by the authorities and taken forcibly to Guatemala, and left in a remote rural area. Marcello and one of his associates narrowly escaped being murdered by two South American men for what little money they had allegedly guiding them back to a city, where they could return to the United States. Marcello barely survived this incident, and sustained fairly serious, or at least very painful, injuries in his escape. In 1966 Marcello was arrested in New York City after having met with the National Commission. The meeting was reportedly called because Marcello's leadership was being challenged by Tampa Mafia boss Santo Trafficante, Jr. and Anthony Carollo, the son of Marcello's predecessor as boss of the New Orleans Mafia. The Commission had reportedly ruled in Marcello's favor just before the police burst in. Marcello was then charged with consorting with known felons and after a long drawn out legal battle he was eventually convicted of assaulting an FBI agent whom he had punched in the face on his return to Louisiana. Sentenced to two years in prison, he served less than six months, and was released on 12 March 1971. In his autobiography Mob Lawyer (co-written with journalist Selwyn Raab), Ragano added that in July 1963, he was once again sent to New Orleans by Hoffa to meet Marcello and Trafficante concerning plans to kill President Kennedy. After Kennedy was killed, Hoffa apparently told Ragano: "I told you that they could do it. I'll never forget what Carlos and Santo did for me." He added: "This means Bobby is out as Attorney General". Marcello later told Ragano: "When you see Jimmy (Hoffa), you tell him he owes me and he owes me big." In 1981, Marcello was convicted on charges relating to an undercover sting and was sentenced to federal prison. 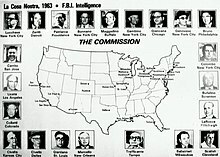 There, in 1985, Marcello allegedly bragged to prison cell mate and FBI informant Jack Van Laningham that he masterminded the assassination of President Kennedy and planted red herrings to confuse the press and embarrass the FBI and CIA into suppressing evidence that would have revealed illegal covert U.S. operations in Cuba. Carlos Marcello died in one of his mansions in Metairie, Louisiana on 3 March 1993 as a free man, having been released in 1989 after his initial conviction on bribery charges was overturned. The New Orleans Combine frequently met at a well-known exclusive Italian restaurant, Mosca's, built in 1946 beside Highway 90 west of Avondale in what at the time was a mostly rural area, across the Mississippi River from New Orleans. It has been said that Mosca's was the epicenter for Carlos Marcello and his many associates. It is still in operation today after renovations by the Mosca family following Hurricane Katrina. Another restaurant in the Fat City area of Jefferson Parish was the frequent eating establishment of Marcello's brother, Sammy Marcello, well into the 1990s. The restaurant, Salvatori's, was known for its delicious five star cuisine, but is now permanently closed. The Marcello family and descendants still own or control a significant amount of real estate in Southeast Louisiana. Locals often cite legends alluding to the possibility of many bodies being dumped in the swamps owned or formerly owned by the Marcello family, and the subsequent consumption of these deceased individuals by local alligators. 1990-2007: Anthony Carolla – imprisoned in 1995-1998; died on February 1, 2007. 1880-1881: Vincenzo Rebello – deported to Italy in 1881. The 1999 HBO movie Vendetta, starring Christopher Walken and directed by Nicholas Meyer, is based on the true story of the March 14, 1891, lynchings of 11 Italians in New Orleans. Charles Matranga (also spelled "Mantranga" in some documents) was one of the intended victims, but managed to survive by hiding from the mob. In the Journal of American History, historian Clive Webb calls the movie a "compelling portrait of prejudice". ^ Rawson, Donald (August 3, 2017). "Bust Card in Biloxi: The Fall of the New Orleans Mafia". Louisiana Mafia. With the upper echelon of the New Orleans Mafia in jail with enormous restitution to repay, it would be an organization struggling to make it into the new millennium. While the FBI has said modern Italian organized crime still exists in some limited capacity in New Orleans, Anthony Carolla, Frank Gagliano, and Philip Rizzuto would all pass away in the early to mid 2000s with little fanfare. It seems like the New Orleans Mafia, the oldest Mafia organization in the United States, would die with these men. ^ "The Resurgence of the New Orleans Mafia?". Louisiana Mafia. March 12, 2015. If there are any remnants of the New Orleans Mafia left, and more than likely there is, this incident is probably not an indication of the organization’s resurgence. ^ a b c Chandler, David (10 April 1970). "The Little Man is Bigger than Ever: Louisiana Still Jumps for Mobster Marcello". Life (68). pp. 30–37. ^ Baiamonte, John V., Jr. (Spring 1992). ""Who Killa de Chief" Revisited: The Hennessey Assassination and Its Aftermath, 1890-1991". Louisiana History: the Journal of the Louisiana Historical Association. 33 (2): 117–146. JSTOR 4232935. ^ McCarthy, Brendan (January 29, 2012). "Carlos Marcello: The Times-Picayune covers 175 years of New Orleans history". The Times-Picayune. Retrieved 18 May 2016. ^ "1951: Mafia boss Carlos Marcello". The Times-Picayune. November 24, 2011. Retrieved 19 May 2016. ^ Lamar Waldron, "The Hidden History of the JFK Assassination", (2013). ^ The Times and Democrat, ed. (1896). "Salvatore Matranga, New Orleans 1896 Nov 15". Newspapers.com. ^ Critchley, David (2008). Routledge (ed.). The Origin of Organized Crime in America: The New York City Mafia, 1891–1931. pp. 59–60. ^ Webb, Clive (2000). "Review". The Journal of American History. Oxford University Press. 87 (3): 1155–1156. JSTOR 2675451. Brouillette, Frenchy. Mr. New Orleans: The Life of a Big Easy Underworld Legend, Phoenix Books, 2009. Kurtz, Michael L. (Autumn 1983). "Organized Crime in Louisiana History: Myth and Reality". Louisiana History: the Journal of the Louisiana Historical Association. 24: 355–376. JSTOR 4232305. Raab, Selwyn (2005). Five Families: The Rise, Decline, and Resurgence of America's Most Powerful Mafia Empires. New York, N.Y.: St. Martin's Press. ISBN 978-1429907989. Summers, Anthony. Conspiracy. New York: McGraw & Hill, 1989. Rappleye, Charles. All American Mafiosi. New York: Doubleday, 1991.